Note: Louisville Parks and Recreation (Louisville Parks) and the Louisville Metropolitan Sewer District (Louisville MSD) are working together to implement green infrastructure improvements within west Louisville’s Chickasaw Park — improvements that advance community resiliency goals and support the NRPA Great Urban Parks Campaign. Louisville is committed to being a resilient city, one that creates a culture of equity, compassion and trust to address structures and systems preventing residents from achieving their full human potential. Building on community engagement, Louisville will be a city where every resident has opportunities to thrive, including the opportunity to experience the beauty of vibrant natural spaces. The Natural Areas Division of Louisville (Kentucky) Parks is increasing equitable access to nature through its Louisville Is Engaging Children Outdoors (Louisville ECHO) initiative. The department is addressing social determinants of health by expanding environmental education and outdoor recreation programming within underserved communities, including communities of color in west Louisville, and the program has expanded steadily since its inception in 2008. “It’s become a holistic, multi-partner initiative that’s creating “cradle-to-career” access to nature and green space for nearly 2,500 youth through complementary, age-appropriate activities, including nature play, school field trips, out-of-school time outdoor recreational programming and summer youth employment,” says T Gonzales, interim director of Louisville Metro’s Center for Health Equity, a key partner since 2012 whose health equity data has been instrumental in identifying Louisville ECHO’s focus neighborhoods. 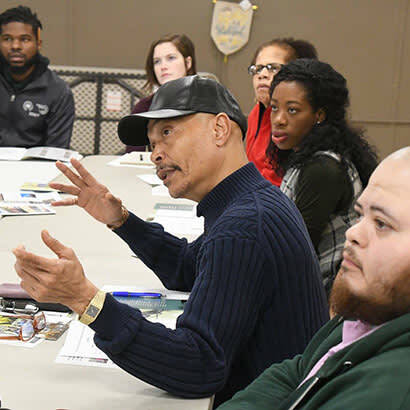 Local agencies, such as Louisville Parks and Louisville MSD, must work collaboratively over a sustained period with residents and other community stakeholders to address historic community issues. Only then will we create neighborhood-level opportunities for families to safely explore nature within parks along the Ohio River. The support from NRPA’s Great Urban Parks Campaign (GUPC) help activate a meaningful partnership with Louisville MSD, which manages the city’s stormwater, wastewater and flood protection services; monitors the health of its waterways through an expansive stream monitoring network; and improves the community’s water resources. Louisville MSD works to achieve a vision of safe, clean waterways in Louisville Metro. Louisville Parks and Louisville MSD work collaboratively, designing enhancements within Chickasaw Park that will improve water quality, habitat and ecological function. Through robust community involvement, including engagement of residents in decision making, this project will improve public accessibility to a valuable urban water resource and historic Frederick Law Olmsted-designed park. The current project will implement green infrastructure improvements to remediate stormwater drainage at the pond’s western end. This discharge will pass through a series of bioswales, and step pools will be sized to treat stormwater discharge from the full project site. Once pond reconstruction is complete, stormwater from the watershed will be disconnected from the combined sewer system. Young adults participating in Louisville ECHO’s summer job component will assist in installation and further improve stormwater infiltration through ecological restoration activities. As they assist summer environmental education programming at Chickasaw and other neighborhood parks, these young adults will build their résumés by mentoring children from partnering community centers. Bennett Knox is Parks Administrator of the Louisville Parks and Recreation Departments Natural Areas Division (@loukyparks, @JMforest). Erin Wagoner is an Engineer and Project Manager with Louisville MSD (@louisvillemsd).